West of Palermo, just after Castellammare del Golfo, the coastline becomes rugged, rocky and, in places, spectacular. That most natural of sculptors, the sea, has worked minor miracles, creating a myriad of coves, sea stacks and grottoes in the hard limestone cliffs. One part of the coastline in question is home to the Nature Reserve of Lo Zingaro, created in 1981. Stretching along the coast for 7km from Scopello in the east to near San Vito Lo Capo in the west, this park is one of the most beautiful parts of western Sicily. Windswept and weather-beaten, Lo Zingaro has been shaped by nature to stunning effect. Cliffs drop precipitously into the azure sea , mountainsides rise steeply up to heights of 1,000m and the series of delightful pebbly beaches with transparent turquoise water are as lovely as you can find in the Mediterranean. 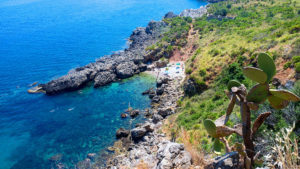 The park attracts both walkers and bathers alike and in the summer, when many beaches are overcrowded, it is a good idea to head for Lo Zingaro, walk for half an hour and spend the rest of the day in relative isolation on a virtually deserted beach. For centuries Lo Zingaro was inhabited by small communities of farmers who grew wheat and kept livestock. It was also home to smugglers who sheltered in the coves and used the numerous grottoes as storage space for their merchandise. The legendary bandit of Montelepre, Giuliano, was also known to have hidden out in the territory on a variety of occasions. From afar, Lo Zingaro looks relatively stark and trees are a rarity. On closer inspection, however, one comes across a great variety of flora that is especially suited to the terrain. The humid microclimate makes it possible for over 650 different species to thrive here. Dwarf palms and other shrubs line most of the paths, while in the spring, the grass of the slopes is dotted with thousands of colourful wild flowers, some endemic to the area, such a rare type of sea lavender (Limonium Flagellare) and many other more common species including crocuses, anemones, irises and various kinds of orchid. The Nature Reserve is also a magnet for ornithologists who come to study the local bird population, which includes eagles, peregrine falcons, partridges, kestrels and various kinds of owl. Sea birds also abound. On the animal front you may well cross paths with weasels, hedgehogs, foxes, lizards and even the occasional, harmless, vipers. If you’re in the area, whatever the seaons, you really should take a trip!